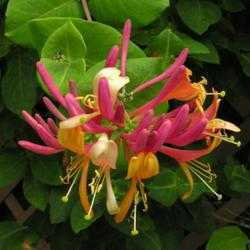 Coral honeysuckle, Lonicera sempervirens, is native to North America, east of the Rocky Mountains. It is a well-behaved scrambling vine or shrubby plant with lovely deep salmon-red, trumpet-shaped blooms that attracts hummingbirds, bees and butterflies. Unlike its thuggish cousin, Lonicera japonica, it isn't invasive or hard to control, making it ideal for even small gardens. The deep coral blooms are produced in vast masses early in the spring and then continue to bloom more sedately as the summer progresses. Here in my south west Kentucky garden, it starts to bloom in March, with the main show in mid to late April, tapering off to a respectable handful of blooms for the rest of the season. Gardeners further south could have blooms in January or February. Hummingbirds find it extremely attractive and it seems to stay in bloom for their entire sojourn here in this area, with blooms still in evidence in mid-October when my hummers depart. This is an easy to grow native that likes just about any well-drained soil. It does best when the pH is a little acidic, but isn't fussy if it's not. Once it is established, it is quite drought tolerant, but blooms best with regular water. Coral honeysuckle even provides winter interest in the southern part of its range because often the leaves remain green. (that's what sempervirens means...always living) And it produces red seed-bearing berries that cardinals adore. Few pests and diseases threaten it and it is a host plant for a few butterflies and moths. There are a number of named cultivars that the nursery trade has developed and many mail order sources offer it because it is a forgiving plant to ship. However, my coral honeysuckle isn't one of these. It came from a plant that has been in the family over 100 years. The original plant was my Great Aunt Althea's and it grew beside her old homeplace in Calvert City, Kentucky. Our family has taken cuttings from this plant for decades and it grows in a number of states as a reminder of our heritage. I took my cutting from my Mom's plant in 2001 when she sold our farm. Her brother had planted a cutting there years ago and now, its progeny happily blooms at my house, just like it has for countless relatives across the years. Our coral honeysuckle has a story and we're still passing it along to younger family members. That's one of the benefits of taking a cutting, the resulting plant is genetically identical to the parent, since it is actually a part of that plant. To take a cutting of a coral honeysuckle plant, do so when the plant is actively growing. Early summer is best. Make sure that the parent plant has been hydrated well the day before, so that tips of the vine are full of moisture. Take cuttings in the morning, choosing healthy stems 4 to 6 inches in length, preferably without any blooms and cut at an angle about 1/4 inch below the last set of leaves. If the stems have blooms at the end, remove them as that saps energy from the plant as it tries to produce roots. Remove all but one or two sets of leaves as well. This keeps the cutting from having to support a heavy leaf cover while it is rooting. I like to use a rooting hormone powder as it helps the plant root faster, but it isn't extremely important if you don't have any. If you're using the hormone powder, dip the cut end in it up to about 2 inches and gently tap off the excess. Place the stem in your prepared potting soil that is slightly damp and press it to make sure that the stem comes in contact with the soil. Place in a sheltered area that has bright, indirect light but does not receive direct sun and keep the soil moist, but not wet. It takes between 6 and 8 weeks for new growth to emerge. 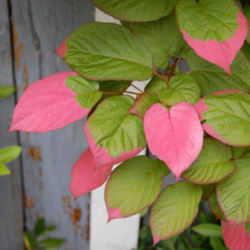 When tiny new leaves are visible, the cutting is rooted, but still fragile. I generally wait another 2 or 3 weeks before gradually moving the container into a sunnier location. In other words, this process will take most of the summer. I've even left the cuttings in containers all winter, sheltering them in my garage during the worst weather and waited to plant them out in the garden the next spring. Give your coral honeysuckle a sturdy trellis or place to scramble. In the beginning, you'll need to train it to the support because it doesn't cling like a number of other vines, but after it is established, the older, woody sections help support the new growth. If you must prune, do so after the main flowering to give it time to produce buds for the next year. 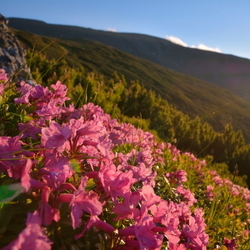 It blooms best in full sun, but does survive in shadier locations. Its blooms will not be as numerous and its bloom season will not be as long in partial sun, but it can live there. Coral honeysuckle is an excellent alternative to non-native and invasive species and many HOA approved plant lists include it. It doesn't have the fragrance that its invasive cousin, Lonicera japonica (Japanese honeysuckle) does, but it isn't considered a noxious weed either. Honeybees and hummingbirds love it and it makes a nice addition to most any garden.